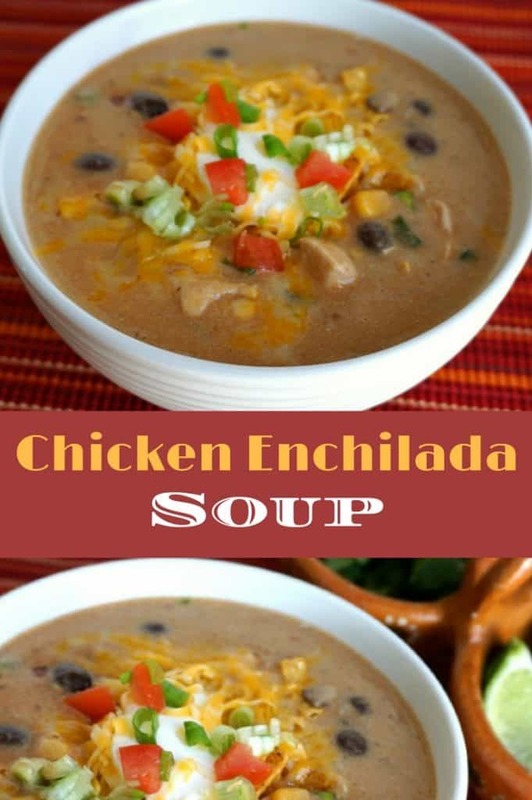 Chicken Enchilada is one of my favorite soup recipes for a few reasons. 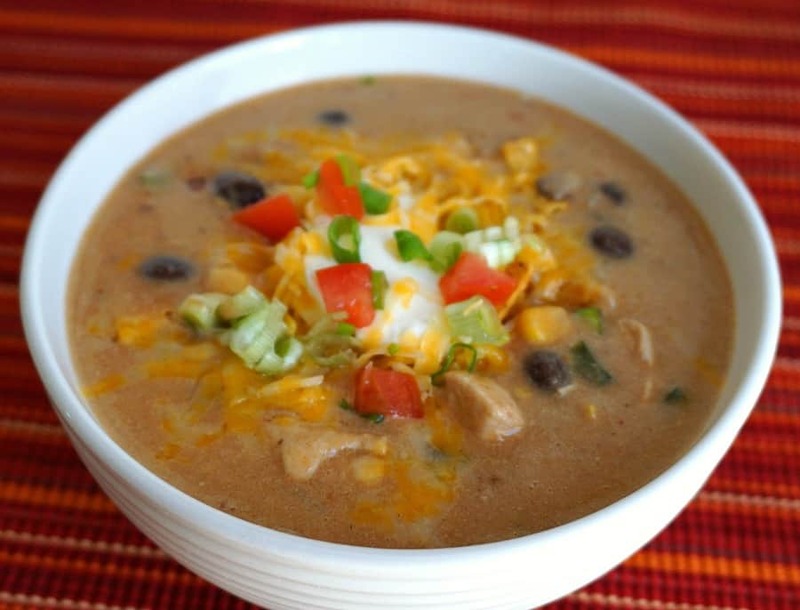 A nice basic vegetable and chicken soup is nice, but add to that a little bit of spice, a thicker consistency with the addition of corn flour, and a good dose of cheese. The soup just gets better by piling on the toppings. 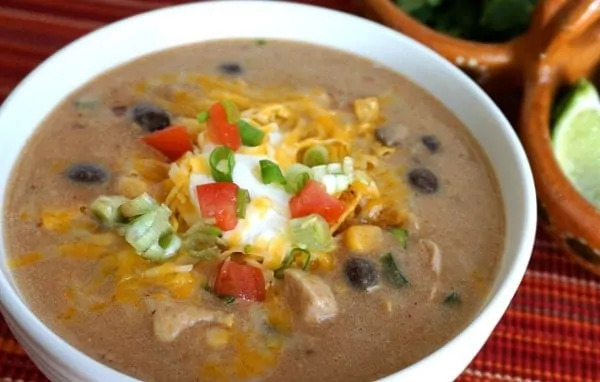 I like my soup loaded with sour cream, crispy tortilla strips, pico de gallo, more cheese, fresh cilantro, green onions and then a dash of hot sauce. And the last thing to love about this soup (beyond the fact that it is absolutely delicious) is that it can be ready to eat in about 30 minutes from start to finish! I’ve included a link to my homemade red enchilada chili sauce, which I like to keep on hand to make a lot of my other favorite recipes from south of the border. Visit our Food Finds/Recipes section to view our entire collection or recipes inspired by our travels around the world. Add the oil to a small stock pot over medium heat. Once the oil is hot (sizzles when you sprinkle cold water by flicking your fingers into the pan) add the chicken. Season lightly with salt and a sprinkle of cumin and cook until lightly brown. Set aside. (Note, 2 cups (250g) of shredded rotisserie chicken will also work well). Add the onions to the pan and saute until translucent (5 â€“ 8 minutes). Add the garlic and chili and cook for about 2 minutes. Add the ground cumin and stir for another minute until the cumin becomes aromatic. Add the masa harina and cook for 1 â€“ 2 minutes (to remove the raw flavor from the flour). Add the chicken and enchilada sauce and saute until the mixture begins to bubble. Pour in the stock and stir until all of the ingredients are combined. Add the black beans and corn. Stir occasionally until the mixture returns to a simmer. Add the cheese slowly until it is melted.